Acupuncture is a complete system of medicine based on principles which have been used in Chinese medicine for the last 4000 years. It works with the natural energies inherent within all living things, to promote the body's ability to heal itself. The ancient Chinese medical classics describe a system of energy pathways whose flow near the surface of the body relates to the body's deeper internal organs and their functions. Acupuncture works with these energy pathways and the "Life Force" flowing through them. This Life Force or "Qi" (pronounced "chee") is the vital energy which created the body originally and continues to keep it alive and functioning properly. It is the energy which orders digestion, contracts muscles, allows bones to mend, and wounds to heal. It is the Life Force or "Qi" that has the perfect intelligence to repair the body when damage or disease occurs. There is a saying from the ancient classic The Huang di Neijing: "Where there is not the free-flow of Qi there is pain (disease), where there is the free-flow of Qi, there is no pain." It is the unobstructed flow of Qi that alleviates pain and can promote a return to internal harmony and health. In Chinese medicine, disease manifests and is not cured when this life force becomes weakened or obstructed to such an extent that it can no longer heal or maintain health. Disease shows up as an imbalance in the energy currents (called meridians), the pathways through which the Qi passes. 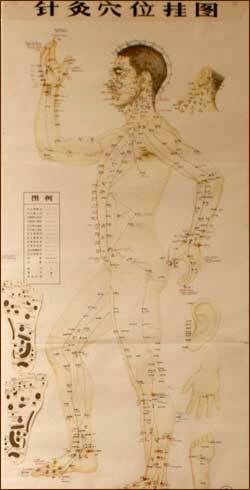 The ancient masters of acupuncture traced these pathways or meridians. They located points along the meridians where the life energy communicates with the surface of the body, and where this Qi can be regulated and its flow adjusted or facilitated. Modern science has been able to measure the electrical charge at these points, confirming the location of many of them precisely as mapped by the ancients, but it has not yet come to understand them. These acupuncture points are used for traditional acupuncture, moxibustion, and hand treatment. Chinese sages also understood a system for determining the quality and mobility of life energy in each person. This diagnostic system, which involves palpation of the six pulses on each wrist, is still used today in Oriental medicine, along with other profound techniques of diagnosis. By means of the pulse diagnosis, the practitioner knows which channels or meridians of life energy are either weak or over-strong and how to best assist the overall balance in these channels. By monitoring the various pulses, an acupuncturist can monitor the progress and effects of treatment. Acupuncture needles are very, very fine and flexible, about the diameter of a thick hair. Insertion by a skilled practitioner can be completely painless. In most cases needles are inserted just below the surface of the skin to engage the body's response, which is called 'the arrival of Qi'. The needle may then be slightly stimulated until the body is aware of its presence and can respond. This sensation is a part of the body's healing response. The overall experience and effect of the acupuncture needles can feel quite good especially in areas that have been blocked are re-awakened by life energy. There are certain techniques used in Chinese medicine which can be uncomfortable, because sometimes can feel slightly painful mobilizing energy which has been stagnating. However, on a more familiar scale, acupuncture, bears no resemblance to the feeling of getting an injection. The main source of pain from injections is from the hollow needle and the medication being forced into the tissue by pressure. Acupuncture needles are used to attract or disperse energy along the meridians—not for injections. How Do Most People Respond to Acupuncture? Generally acupuncture creates a heightened sense of well-being for the patient and most patients feel progressively better after each treatment. Some illnesses, however, dull the senses so that the symptoms' full severity is no longer clearly felt. Imbalance is not clearly perceived. As the life force returns, the restoration to balance feels 'different'. Sensitivity returns, and it is possible that a person could feel temporarily worse. This passes in a short time. More severe illness can be of a complicated nature. It is possible for symptoms to return that had been present years before, as treatment progresses. This is because, in getting to the chief underlying cause of ill health, Chinese medicine reverses the course of sickness rather than masking current symptoms. Chinese medicine describes this process symbolically as having several conditions one on top of the other, like sheets of paper. The top condition is taken off, exposing the one beneath. They must all be taken off one at a time and this will often recreate the symptoms temporarily while healing is taking place. When the last sheet is removed, the healing has addressed the core imbalance and the return to health has been completed. The amount of treatments, or length of time necessary to address a health problem is dependent on several factors. The length of time that a disease or condition has been in the body, the condition of the lifeforce, and the constitution of each individual patient must be taken into account and considered when determining the necessary number of treatments. Some conditions will respond immediately with just one treatment. Most conditions should have the treatment results and progress evaluated after the second and third treatment. Many chronic conditions require a minimum of ten treatments to alleviate symptoms and balance the energy so that symptoms are not likely to recur, and so that the balance is permanently held. This can also be better accomplished or accelerated with the assistance of herbal remedies.